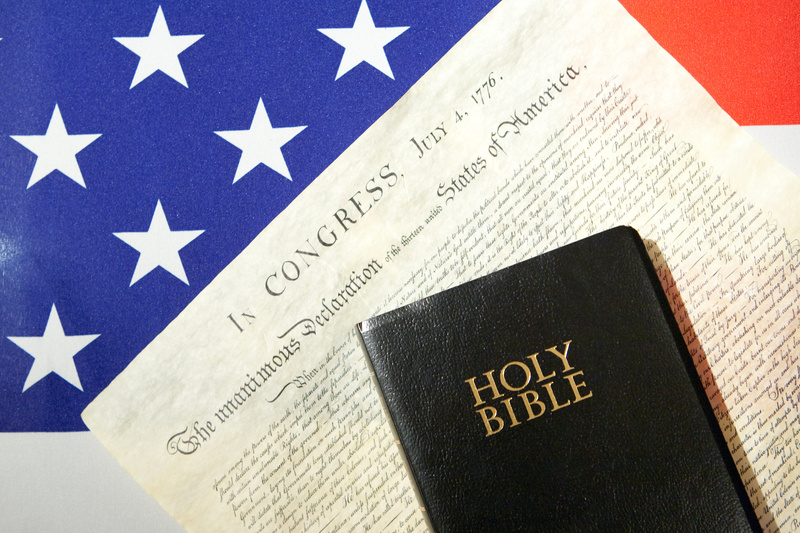 “Identity Crisis”: Is America a Christian Nation? Monumental: In Search of America’s National Treasure was released on March 27, 2012. It documents Kirk Cameron’s quest to retrace the steps of America’s founders in order to discover what made them successful. Cameron shares his anxiety over the current state of our nation. He notices that everyone is blaming others for it rather than finding a solution. He then travels to England, Holland, and Massachusetts to find the secret to America’s success. His feelings represent those of the American church. Many Christians believe America was founded by godly men upon biblical principles. They believe it was a Christian nation, and some view “America” as synonymous with the “people of God”! But is this necessary? Is America truly a Christian nation? Should we despair when it behaves in worldly ways? The Bible says the nations of the world are under the dominion and lordship of Satan (1 John 5:19; Matthew 4:8). This surely includes America. The racial tension, immorality, and violence in our nation are proof of this! But the Bible also says the church is the nation of God. Peter calls us “a chosen people…a holy nation, a people belonging to God” (1 Peter 2:9). Paul says God “brought us into the kingdom of the Son he loves” (Colossians 1:13). So the Bible calls Christians a “people,” “nation,” and “kingdom.” It also says “our citizenship is in heaven” (Philippians 3:20). The church is its own political entity! Jesus has made us citizens of His country and given us a new national identity. What does this mean for America? It means that America is not a Christian nation. Although the Pilgrims and Founding Fathers may have been guided by Christian faith, the true Christian nation was already founded long ago by Jesus. Therefore, we should not despair when America acts in ungodly ways. Nor should we be plunged into an “identity crisis.” It is unfortunate that America is no longer blessed by a strong Christian presence. But that doesn’t undermine the church’s identity as the people of God. There is, however, a legitimate cause for despair. Have you ever wondered why America seems to no longer enjoy God’s favor? It isn’t because America is less godly. Rather, it’s because the American church is less godly. The American church is the weakest, most atrophied member of the body of Christ. Although we have more resources and rights than Christians in other countries, we are the laziest and least productive in our faith. Individual believers and entire denominations are compromising with the world’s standards. So if you want to despair, despair over the state of the church. Stop blaming the government, “For it is time for judgment to begin with the family of God” (1 Peter 1:17). Ask God to convict us with “godly sorrow [that] brings repentance” (2 Corinthians 7:10) so we may regain our former influence over this nation. Is America a Christian nation? Share your thoughts with a comment below! Exactly! I think this is hard for us to remember in first-world countries because we live so comfortably. Someone in a third-world country is probably much quicker to realize this. Do you live in Canada? Yes, I live in BC. I am reading a book called “Radical” by David Platt right now. It’s about how Christians have lost sight of our calling all because of the “American dream”. It’s very challenging and I’m only part ways through it. I don’t want to be a wishy-washy Christian, but I am ‘oh so comfy’ here in our homeland. May God have mercy on us all! I loved that book! You’re right, it is challenging. A great wake-up call for the first-world church!